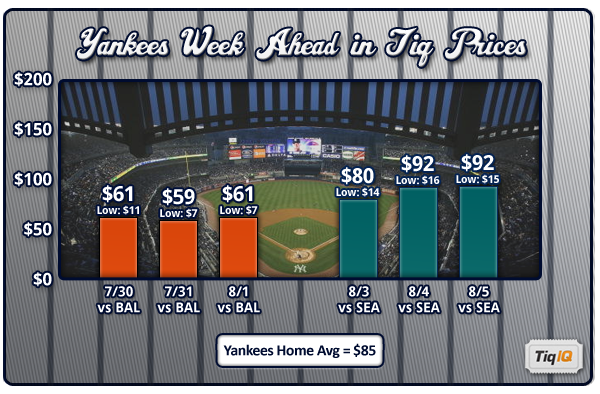 Besides the already low prices for this week's series in the Bronx, TiqIQ also has some great ScoreBIG/Make-An-Offer deal opportunities for you to rack up even more savings. These make an offer deals can't be beat and tickets can sometimes be had for as low as $10, and you don't have any pesky service or shipping fees to worry about. Just name your price and avoid all the hassles. Click here to sign up for for your own ScoreBig account and start saving today: http://tiqiq.us/CRz 7/31 vs Baltimore: Save 53% and offer $52 for 3-star seats (List price: $110.64) 8/1 vs Baltimore: Save 51% and offer $35 for 2-star seats (List price: $71.72) 8/3 vs Seattle: Save 50% and offer $98 for 5-star seats (List price: $195.00) 8/4 vs Seattle: Save 25% and offer $95 for 4-star seats (List price: $127.32) 8/5 vs Seattle: Save 28% and offer $80 for 3-star seats (List price: $110.64) Click the Golden IQ to make an offer and get to The Stadium for less! 700+ tickets starting @ $40. 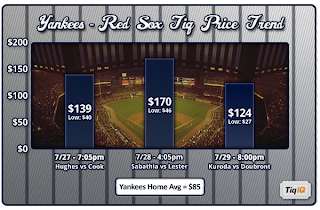 75+ tickets available for less than $55, including some that are selling for as much as 41% below market average. Bleacher tickets start @ $40 and there are 100+ available for less than $70. These seats are selling from 4% to 30% below market avg. Grandstand tickets start @ $46 and there are 100+ available for less than $75. Some of these seats are selling for up to 31% below market avg. Main Level tickets start @ $91 and there are 20+ available for $150 or less, some for up to 47% below market avg. Field Level tickets start @ $105 and there are 30+ available for less than $200. Some of these seats are selling for up to 43% below market avg. 70+ tickets available for less than $60, including some that are selling for as much as 49% below market average. Bleacher tickets start @ $57 and there are 90+ available for less than $65. These seats are selling from 29% to 36% below market avg. Grandstand tickets start @ $46 and there are 100+ available for less than $70. Some of these seats are selling for up to 49% below market avg. Main Level tickets start @ $83 and there are 100+ available for less than $125, some for up to 47% below market avg. Field Level tickets start @ $100 and there are 90+ available for less than $175, some for as much as 50% below market avg. 60+ tickets available for $35 or less, including some that are selling for as much as 52% below market average. Bleacher tickets start @ $38 and there are 150+ available for less than $50. These seats are selling from 31% to 51% below market avg. Grandstand tickets start @ $27 and there are 400+ available for less than $50. Some of these seats are selling for up to 52% below market avg. Main Level tickets start @ $51 and there are 60+ available for less than $100, some for up to 50% below market avg. 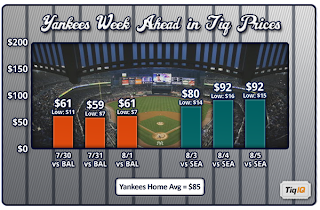 Field Level tickets start @ $75 and there are 90+ available for less than $125, some for as much as 43% below market avg. 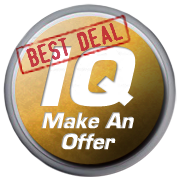 Click the Golden IQ to make an offer and get to The Stadium for less!